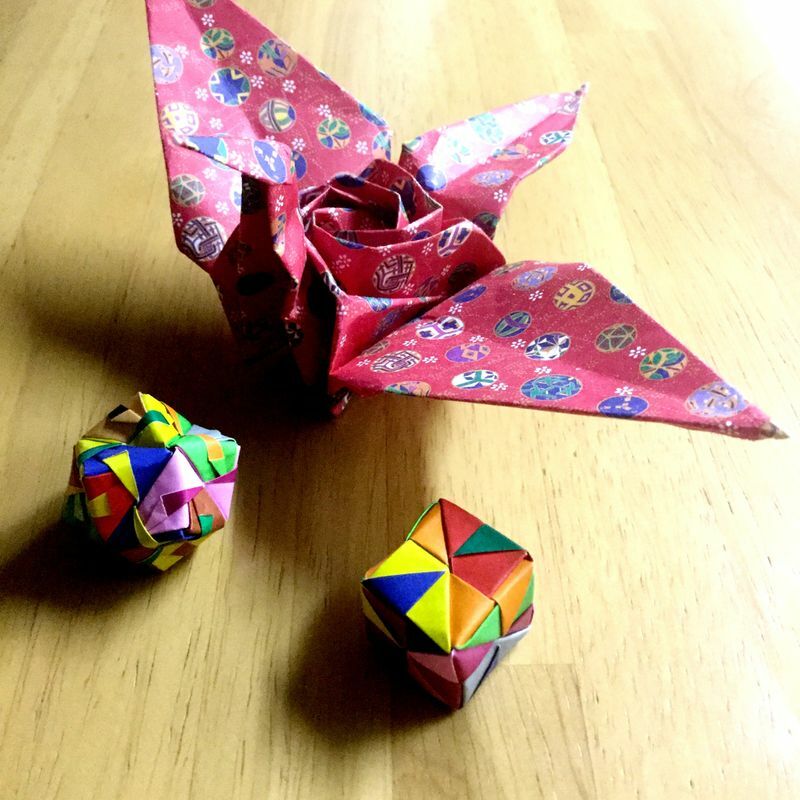 Neighbors and friends gave me ornamental and complex origami recently. The tiny unit origami balls, one with a bell in it, were made by an elderly lady. She does origami to keep her mind sharp. The rose crane I got from a young man who has been recovering from illness. 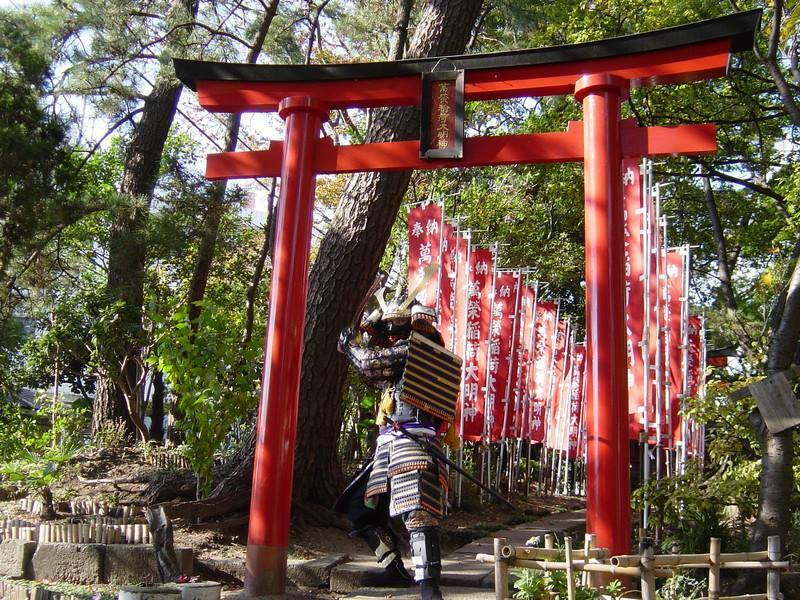 He does complex origami to focus on the positive, and gives his creations as gifts. Their origami inspired me to return to this hobby which I had neglected for years. 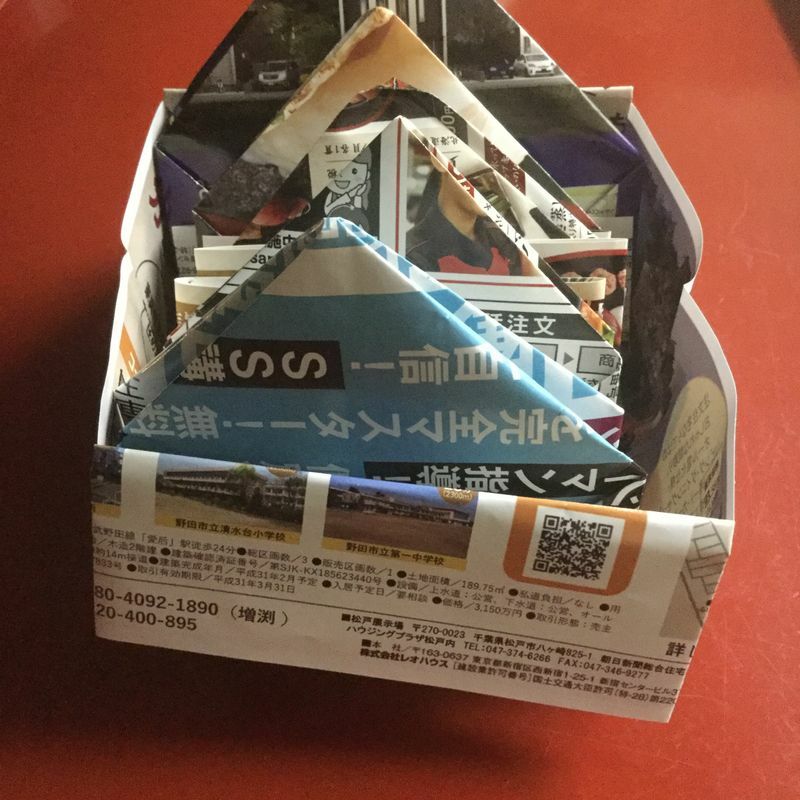 I also like to do complex unit origami boxes. It’s a meditative practice, requiring great attention to detail and precision. I find it very satisfying to finish an attractive object. It takes a lot of thought sometimes to figure out how a a piece of paper becomes a three dimensional object. Following diagrams doesn’t tell the whole story, so the design, and sometimes assembly in the case of unit origami, becomes a brain teaser. The boxes I make are great for gifts, both the package and contents. These boxes, designed by the origami artist Fuse Tomoko, require six pieces of paper each. The texture, weight, and patterns of the paper you choose enhance the designs. I like to experiment with pattern on pattern and contrast. But not all my paper folding is so complex. 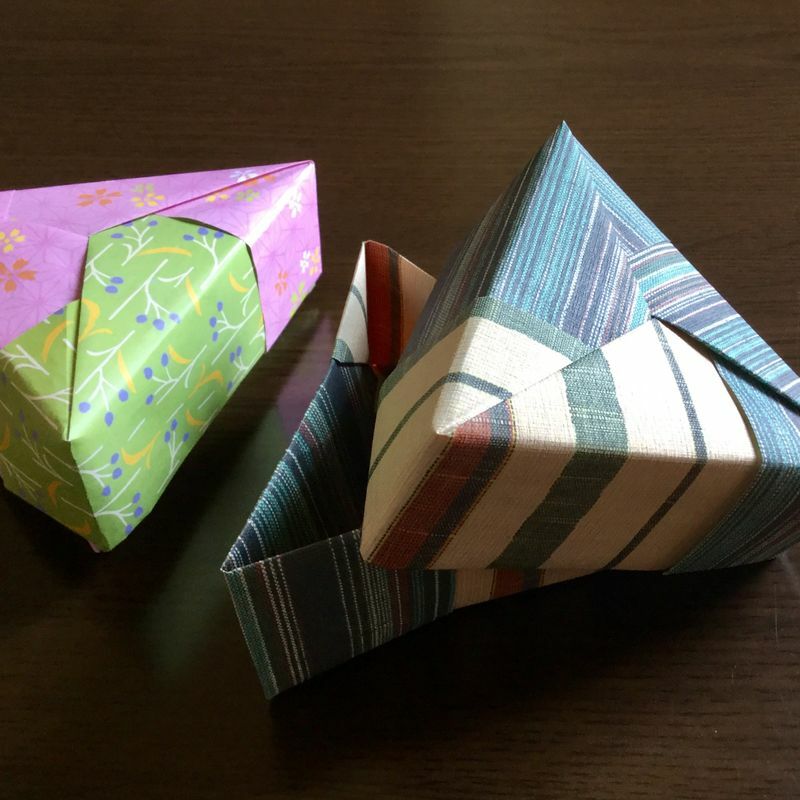 I use simple origami at work and at home for storage and packaging small items. 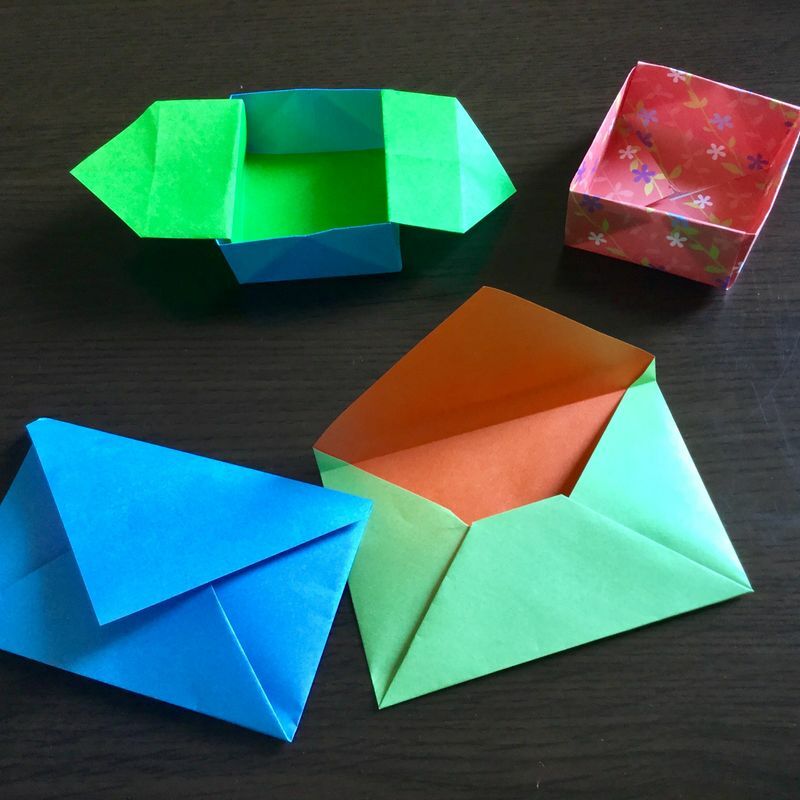 Paper envelopes are easy to make, and double-sided origami makes them attractive. The contrast makes it easy to see the objects inside. The eared box folds flat so the contents stay inside. The classic masu box doesn’t require purchased materials. At the office or school, you’ll see so much glossy, heavy paper from brochures, textbooks and calendars put in the recycling pile, but they make great boxes. You can use scrap cardboard to reinforce the boxes. Last year, I made about a dozen from out of date geography textbooks. I inserted cardboard from boxes that omiyage comes packed in. My desk organizer boxes hold up for the whole year. At home, I get so much advertising through the post. The paper is thin and glossy, but useable. I use the easiest box design made from a rectangle of any proportions. You don’t have to fold these precisely, and once you have made a few, it takes less than a minute to produce one. You’ll see the photos in the gallery. When I’m cooking, I use these scrap boxes for catching kitchen waste. I place these boxes around the house, in the kitchen, toilet, laundry area, and living room. At work, I keep a few in my desk drawer to collect garbage. You don’t need a lot of expensive books to do origami. You’ll find easy English language tutorials all of the ‘Net. A few of my favorites are Paper Kawaii and Origami Instructions. These are so beautiful! You’ve inspired me - I want to be able to make such lovely creations!